Click on either image to view a larger image. At Oregon Wagon and Wheel, we employ contemporary aesthetic, focus on authentic replication and utilize traditional techniques. 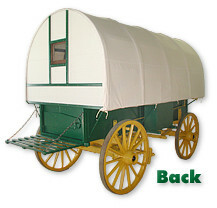 The Oregon Komfort Wagon embodies the spirit not only of the snug home on wheels, but of the Western ideal itself  it is both practical and efficient. Once you access one of the pages above, you can view the other pages in "slide show" format. 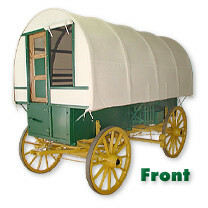 The versatile Oregon Komfort Wagon may be used for camping,display or as a studio. They can serve as an office or child's playspace. One was ordered converted to a sauna . And at a guest ranch, two OK Wagons were joined by a deck.